The Giant African Fruit Beetle is a large and colorful beetle from Africa. It’s a popular pet beetle by young bug enthusiasts. The Latin name of this species is Mecynorrhina polyphemus but it was previously know as Chelorrhina polyphemus. Giant African Fruit beetles are quite large beetles that live in tropical Africa. They are shiny green in color with an rusty orange hue and they have beige – yellow stripes and spots on their back. Their head is beige – yellow and their legs and feet are blackish green. This species reaches a size of around 2 inch (5 cm) . Males become bigger than females and have an antler on their head. Females do not have this antler. The grubs are white-yellow with a brown head. They are born as tiny white larvae, but when fully grown they can be as thick as your finger. The eggs and grubs of this beetle can be found inside the soil. The grubs stay underground eat rotten fruit and decomposing leaves. The adult beetles eat fruit. From egg to beetle takes about 4 to 6 months depending on temperature. The beetle will live for 2 to 5 months. Higher temperatures will decrease the developmental time tremendously. The adult beetles can be housed in a tank of about 30 x 30 x 30 cm. At the bottom of the tank you need to place a thick layer of earth, about 10 cm thick. In this soil the beetles can lay their eggs. The tank can be decorated by fake plants and twigs. A piece of bark or wood on top of the soil can give them a humid hiding place. The grubs can live in a plastic box or terrarium of roughly 1 liter of soil for every larva. Make the layer of soil around 15 cm thick. Through this soil you can mix leaves of deciduous trees, pieces of moldy wood, a little bit of fruit and dry cat food. Make it a bit damp, but not too wet. You can house larvae together, but for better growth you should house them in separate containers. The African Fruit Beetle larvae need a temperature of 22 to 30 °C to develop properly. Mainting a temperature of around 27 °C will be a good target temperature. You need to heat the enclosure of the adult beetles with a light bulb. The temperature under the light bulb should be around 30 to 35 °C while the rest of the enclosure should be around 21 °C. Keep the soil in the terrarium moist, but not wet. The soil should look and feel like a newly opened bag of gardening soil. The top layer can be allowed to dry at bit as long as the rest of the soil is damp. 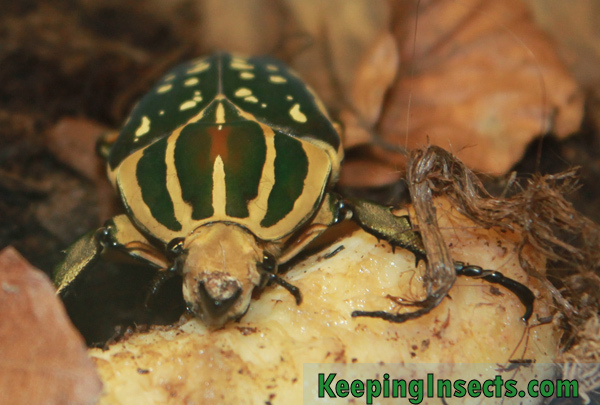 Larvae of the Giant African Fruit Beetle eat ripe or overripe fruit, old leaves of deciduous trees and rotting wood. They also like moistened dry cat food. When feeding fruit, make sure you do not overfeed the larvae as the leftover pieces can become smelly. Make sure that there is always some leaf litter or rotting wood inside the soil with the larvae, you cannot feed them exclusively with fruit. The adult beetles eat fruit and plant sap. You can give them any type of fruit, e.g. apple, banana, orange, mango, kiwi or strawberry but try to vary the type so the beetles need not to eat the same type every day. This could cause nutritional deficiencies. You can also feed them with Beetle Jelly that can be bought in some specialist stores. If you supply a pair of adult beetles with the conditions described in this caresheet, they will breed without any additional help. You can identify the males by their antler on their head, the females do not have this antler. You can rear the larvae in a separate container from the adults or just leave them in the soil of the terrarium the adults also live. You get better breeding results if you separate the grubs from the adults and from each other, but this can be a lot of work.